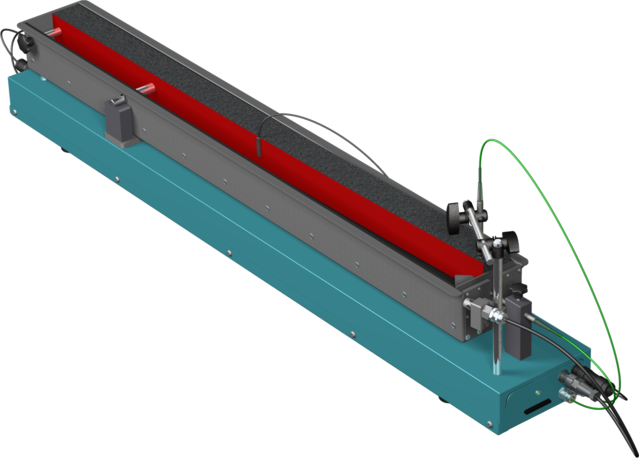 Witth the the Schleibinger Bending Drain you measure the shrinkage and curling of building materials. Also you may simulate with a built in electrical heating a real world floor heating. High precision measurement are guaranteed, by two static abutments and a massive u-shaped steel baseplate. A neoprene foil between the form work and the material avoids friction and blocking of material, also when expanding materials are used. The form work is static independent from the mortar beam which is supported by two well defined points. The Bending Drain has an Intra- / Internet connection and an integrated data logger. No special PC is required during the measurement. The instrument is fully controlled by your network browser software, like the Internet Explorer or similar software. All data are stored inside on non volatile memory for weeks or months. By one mouse click you can load the data directly into your Excel worksheet over a network. You may also transfer you data with a removable Compact Flash card. You may integrate several Bending Drains into your network, but each of it is working indepently. Two high resolution LVDTs with a stroke of 5mm and a resolution of 0.3µm are delivering high reliable results. One RTD is measuring the temperature on the bottom of the form work. The specimen temperature is measured with a thermocouple embedded in the specimen. An additionally moisture/temperature sensor is measuring the humidity and temperature on the specimen surface. For the floor heating you can program a temperature profile over time. For example rising the temperature after 6 days from 20°C to 60°C holding it for 3 days, and coming down to 20°C again.